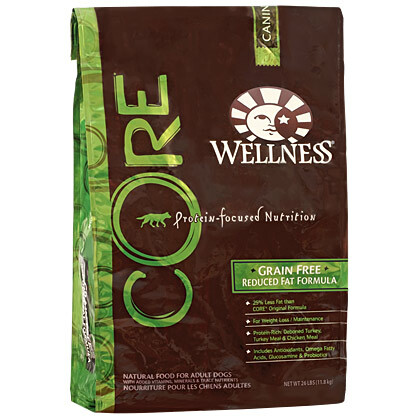 What is Wellness CORE Reduced Fat Dry Dog Food? Wellness CORE Reduced Fat Formula Dry Dog Food is a low-fat dry dog food specially formulated for adult dogs that are less active or need to lose weight. The first three ingredients are named meat products including, deboned turkey, turkey meal and chicken meal, all of which provide a natural source of proteins. 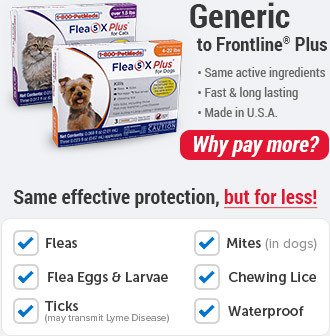 Along with the meat products and meals, it also contains flaxseed to promote a healthy coat and healthy skin. Wellness CORE Reduce Fat Formula contains quality ingredients to help dogs lose weight without leaving them feeling hungry. Wellness CORE Reduced Fat Formula contains 28% less fat than the original CORE formula. 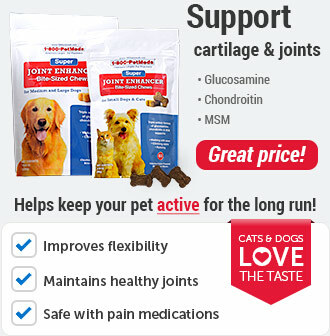 It contains higher amounts of protein and fiber to keep dogs satisfied without the excessive fat and calories, thereby promoting and maintaining a healthy weight. The main starch comes from potatoes making Wellness CORE Reduced Fat Formula completely grain-free, which may be suitable for dogs that have grain allergies. 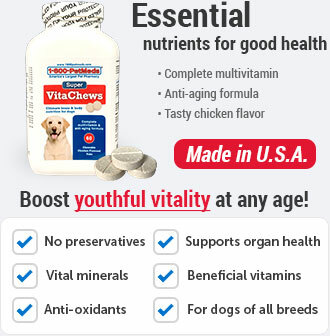 Feed to adult dogs over 1 year that are less active or need to lose weight. 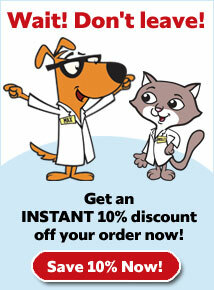 Slowly transition your dog from his or her current diet to their new food. Mix your dog's old food and Wellness CORE Reduced Fat Formula together over a period of 5-7 days, and gradually increase the amount of new food daily so that by day 7 your dog is eating 100% new food. 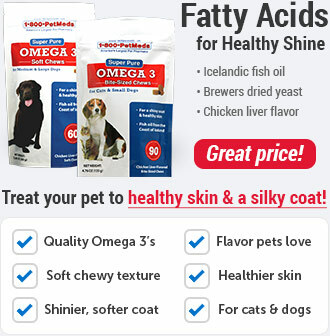 It contains 25% less fat than the CORE original formula but has more fiber to helps dogs feel full longer. 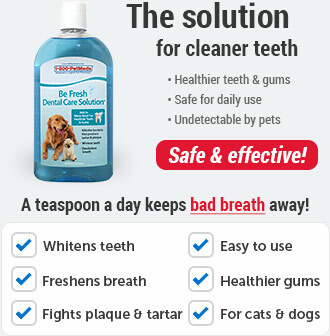 To maintain balanced health, do not to exceed the daily recommended feeding amount. Ingredients: Deboned turkey, turkey meal, chicken meal, potatoes, peas, dried ground potatoes, pea fiber, tomato pomace, chicken fat (preserved with mixed tocopherols), chicken liver, natural chicken flavor, flaxseed, salmon oil, carrots, sweet potatoes, kale, broccoli, spinach, parsley, apples, blueberries, vitamins [vitamin E supplements, beta-carotene, niacin, d-Calcium pantothenate, vitamin A supplement, riboflavin, vitamin D-3 supplement, vitamin B12 supplement, pyridoxine hydrochloride, thiamine mononitrate, ascorbic acid (vitamin C), biotin, folic acid], minerals [zinc proteinate, zinc sulfate, iron proteinate, ferrous sulfate, copper sulfate, copper proteinate, manganese proteinate, manganese sulfate, sodium selenite, calcium iodate], choline chloride, mixed tocopherols added to preserve freshness, glucosamine hydrochloride, chondroitin sulfate, taurine, chicory root extract, yucca schidigera extract, dried lactobacillus plantarum fermentation product, dried enterococcus faecium fermentation product, dried lactobacillus casei fermentation product, dried lactobacillus acidophilus fermentation product, rosemary extract.